SOUTH BEND, Ind.— The top two teams in the country met in front of a sellout crowd in South Bend, Indiana on Sunday afternoon when the No. 2 Connecticut Huskies (7-0) visited the No. 1 Notre Dame Fighting Irish (7-1). 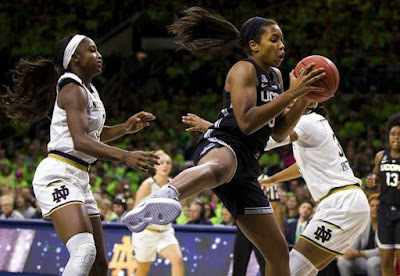 For 36 minutes, the contest shaped up to be the game of the year before UConn pulled away down the stretch to secure an 89-71 victory over the Irish. In the first quarter, freshman Christyn Williams got the Huskies out to a quick start. At the media timeout, UConn led Notre Dame 13-8, with Williams pouring in 11 of those points. Williams finished the quarter with 16 points, pacing UConn to a 27-22 lead at the break. The Huskies continued to expand their lead, but the Irish consistently clawed back into the ballgame. After 20 minutes of action, the No. 2 Huskies led the No. 1 Irish, 44-41. UConn took advantage of second-chance opportunities and converted them into buckets, leading Notre Dame 10-2 in second chance baskets at the half. Notre Dame was unable to connect from downtown, going 0-6 from beyond the three-point arch in the half. UConn managed to expand their lead at the end of the third quarter to 65-59. The Huskies held Notre Dame without a field goal for the last 2:57 of the quarter, allowing the Huskies to continue to creep ahead. The Huskies defense prevailed in the fourth quarter, allowing UConn to outscore the Irish 24-12 in the final ten minutes. Notre Dame shot 28.6 percent from the field in the fourth quarter and 66.7 percent from the charity stripe. Woeful shooting from the free throw line contributed to dropping the contest. On the afternoon, Notre Dame got to the charity stripe 24 times, only sinking 16 (66.7 percent). The poor shooting from the perimeter of the first half carried over, with Notre Dame going just 1-of-12 from deep. Notre Dame was led by Arike Ogunbowale, who contributed a 17-point, 10-rebound double-double for the Irish. Ogunbowale added another five assists in her performance. Jackie Young lead the team in scoring with 18. UConn went with a rotation of just six players throughout the contest on Sunday. Five players scored in double-digits for the Huskies and two players did not exit the game— Williams and Crystal Dangerfield. Napheesa Collier contributed a 16-point, 15-rebound double-double for the Huskies as well. The nation's top recruit had her coming out party against Notre Dame on Saturday. Williams finished with a career-high 28 points for UConn. The dominant performance paced the Huskies offensively and carried them to victory. Notre Dame will go on the road to take on Toledo on Dec. 8 before returning to Purcell Pavilion for back-to-back home games against Binghamton and Western Kentucky. Connecticut will continue its road trip to play Saint Louis on Tuesday before returning home to battle Seton Hall.